ROCHESTER, N. Y. — Before Michael Mota goes to sleep each school night, the 17-year-old lies in bed thinking through his plan for the next day. 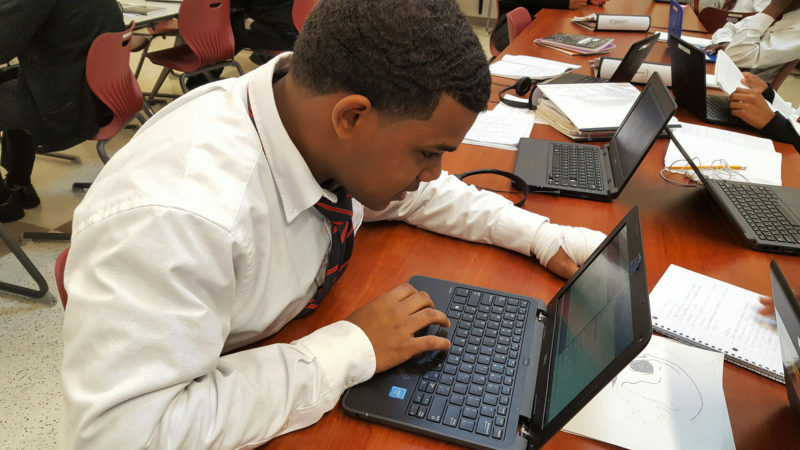 Michael is a senior at Vertus High School, an all-boys charter school in the Rochester City School District whose hallmark is a program that blends online classes with more traditional classroom teaching. Students spend about half their time in computer labs doing online coursework, and it’s this part of the day that Michael plans in advance. He decides whether to tackle a math lesson or a science one, for example, taking into account his own interests as well as his responsibilities. If he’s behind in science, he knows he should focus on that, even if he likes math better. 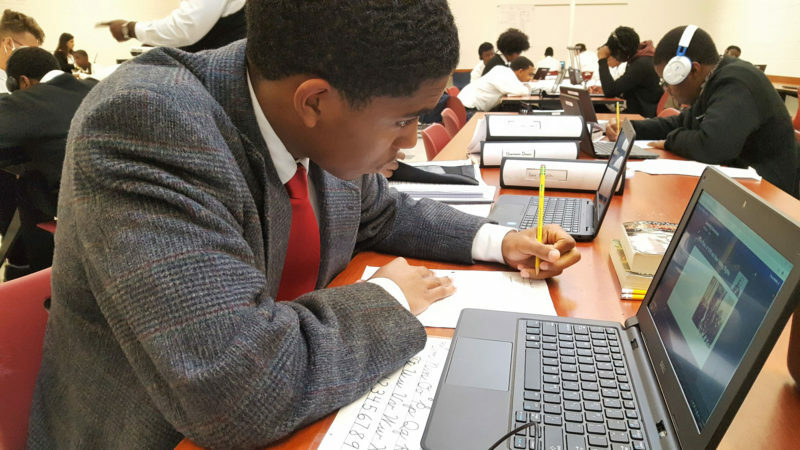 Many of the boys enter Vertus several years behind grade level, particularly in reading and math, and the lab time gives them a chance to fill gaps in their achievement. 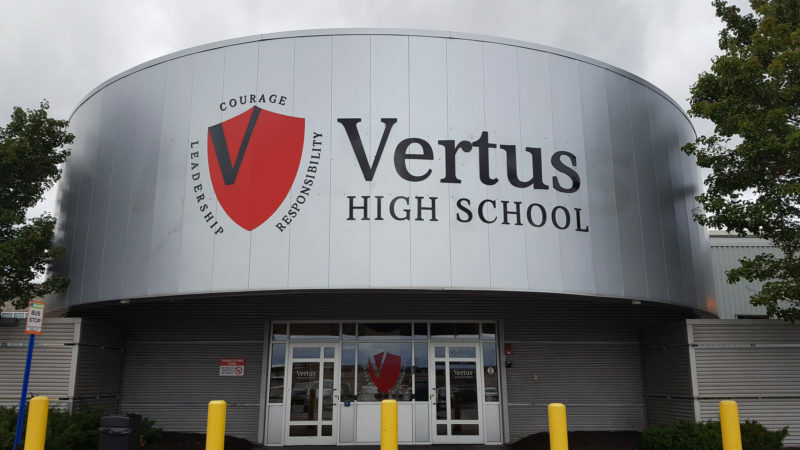 It seems to work: Vertus says that 71 percent of its students pass their Regents exams, required by the state of New York for graduation, compared to 38 percent in the Rochester City School District. For his part, though, Michael appreciates the opportunity to work faster than traditional classrooms allow. He says he used to get in trouble in middle school because he’d finish his work more quickly than his peers and have nothing else to do but goof around. Now, if he finishes a history lesson first, for example, he goes on to the next one – or switches to another subject. Michael likes being able to move at his own pace. “It helps me stay on track and focused,” he said. But Roshawn Murraine, a 16-year-old in his third year at Vertus, said the freedom to move at his own pace is “fake freedom,” because he still has to complete all of his classes within a set time frame. And he says Vertus’s brand of personalized learning isn’t all that personalized. “It’s not like you’re learning different stuff,” Roshawn said. “It’s just a different pace.” Each student still takes life sciences, global history, algebra and the other courses New York State requires for graduation. And, unlike some schools that personalize learning by giving students a say over what they learn in each class and how they prove they have learned it, Vertus requires students to complete the exact same assignments and tests. It turns out that’s common. Personalized learning is among the most popular solutions in U.S. schools today. It is seen as a way to close achievement gaps, increase student engagement and offer a better education to today’s students. Yet it doesn’t have a consistent script and every school does it differently. Giving students more control in the classroom is a common feature of personalized-learning programs, in theory, but in practice, how teachers do that and how much control they offer varies widely. The fact is, offering students choices about their learning experience is difficult. Tanji Reed Marshall, a former teacher and the senior practice associate for P-12 literacy* at The Education Trust, an education research and advocacy organization, recently studied how frequently teachers offer students choices in the classroom. The results – very seldom – were not entirely surprising. Reed Marshall said teachers have to know the standards they’re supposed to teach incredibly well, they have to know their curriculum enough to improvise within it, and they have to stay within the bounds of district and state mandates over what and how they teach. The Education Trust defines three areas in which teachers can give students choice: In what they learn, in the way they learn it and in the way they demonstrate their learning — what researchers called content, process and product in a recent study. While this was not a study of personalized learning, per se, but student choice more narrowly, the results are illustrative. A review of more than 6,800 middle school assignments found only 10 percent of the assignments in English language arts, science and social studies offered students choice in any of these three areas. In math, only 3 percent of assignments did the same, according to the study. Reed Marshall believes that is a grave missed opportunity. Giving students a say in each of these three areas is critical, she said. With the autonomy to make choices, students are more engaged, and when that’s the case, they learn better. Krystal Bankston, who taught math for 10 years in Chattanooga, Tennessee, and now coaches other teachers, saw that firsthand. When she was a teacher, she prioritized giving students a say in how they learned and how they demonstrated their progress. When they were working on projects, they also got to choose what, exactly, they studied. Bankston said students sometimes made the wrong decisions with their newfound power, but that they learned important lessons when they reflected on their choices. 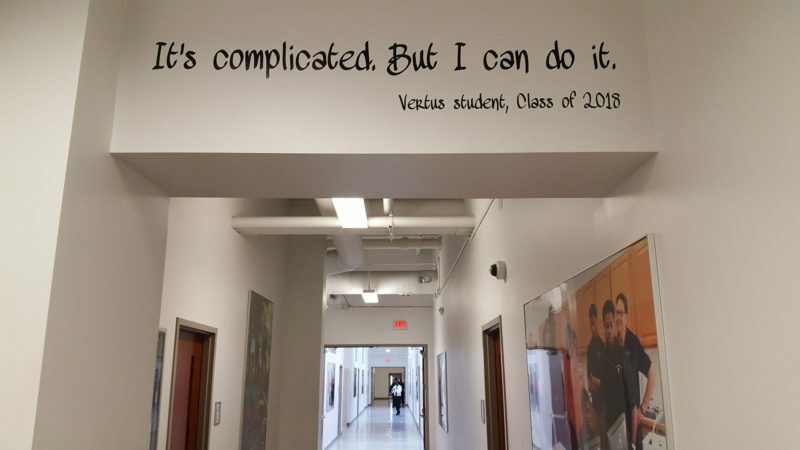 At Vertus, students have a level of autonomy over the process of learning. But their control ends there. Vertus co-founder Leigh McGuigan is frank about why her school sets those limits: In college and in their first jobs, students likely will have to do things the way their professors and bosses say to do them. High school, she said, needs to prepare students for what comes next. Ironically, this is the same argument some educators use in favor of more student control in the classroom. Personalized learning, they say, will prepare students for success in 21st-century workplaces. But McGuigan argues that while some students may end up in jobs that give them freedom and autonomy, most won’t. “We personalize based on what the student needs to be academically successful; we do not necessarily personalize based on what the student wants,” McGuigan said. The fact is, teenagers aren’t always that good at wanting what is best for them, she added, so teachers need to set some boundaries. In 2014-15, the charter school’s first year, some students went months without working on subjects they didn’t like. Now the boys are expected to work on every subject at least weekly and in-school mentors, called preceptors (see sidebar), keep a close eye. “In some cases, it’s just a student being a teenager — ‘I don’t like this; I don’t want to work on it’ — but we don’t want to miss the flags that it’s an academic issue and we need to have an intervention,” said Julie Locey, the school principal. And as much as she said she’d like to give students more say over what to study, the state requirements that every student must meet to graduate are uncompromising. That’s something school leaders across the country must contend with. Amy Huang is the senior director of programs at Chicago-based LEAP Innovations, which created a personalized-learning framework used nationally. She acknowledged that state and even district-level requirements can limit flexibility. The LEAP Learning Framework urges schools to personalize learning in multiple ways. Most schools focus first on giving students more control over their own education through goal-setting, monitoring of their progress and opportunities for self-advocacy, according to Huang. Self-paced instruction, which Vertus offers, is less common because most schools run up against the firm deadlines of the school day and year. Running a charter school, though, Vertus founders were free to add an extra hour to each school day and 20 extra days to the academic year, creating the time necessary to offer students this control. And the promise of such freedom is what hooks many students thinking about enrolling. Even with fairly narrow control over pace, students do take on new responsibility in the classroom. Clovis Meikle, a 17-year-old senior, says that last fall he was spending about four hours on the computer each night. In part that’s because he’s taking an extra social studies class this year and has to put in extra work to stay on track, but it’s also because he knew that when basketball season started, it would take up more of his time. That’s an example of good decision-making teachers tout when giving students more control over their own learning. Though, of course, some of Clovis’s peers are not as self-motivated and forward-thinking, and Vertus educators want them to graduate, too. That’s one reason why The Education Trust researchers advocate offering students control of something beyond just the pace of their learning. Giving students choices about what they learn and how they prove they learned it creates additional opportunities to engage them. Reed Marshall, The Education Trust researcher, says she hopes the study identifying how few assignments offer any choice at all prompts educators to think carefully about the connection between student motivation and engagement and outcomes. Only about a quarter of teachers in the Rochester City Schools are people of color – a stark mismatch with the district’s student population, which is about 80 percent black and Latino. At Vertus virtually all of the students are black or Latino, or both. The founders of Vertus High School, both white, created an uncommon staffing model to get a critical mass of adults in the building who look like the students. While Vertus has 18 teachers this year, almost all of whom are white, it also has 16 adults it calls preceptors, all men, and almost all of whom are black or Latino. Like mentors, these preceptors take primary responsibility for 16 to 20 students, keeping tabs on their academic progress as well as their behavior and attendance. They aren’t trained teachers. 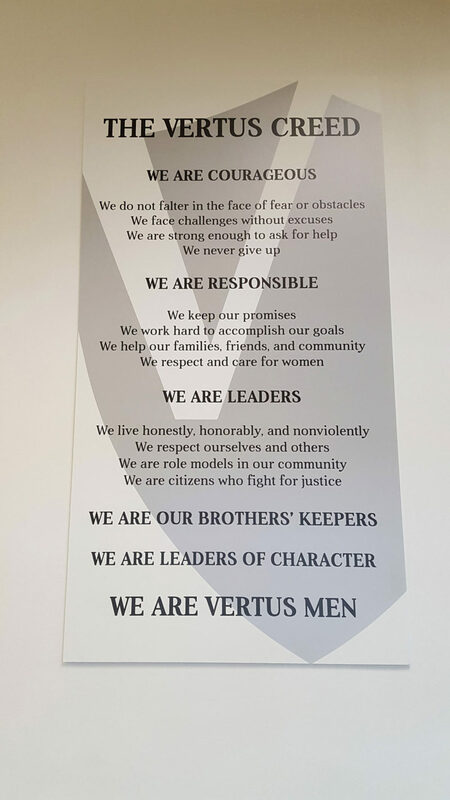 They are college-educated men from the community who offer an example to the boys at Vertus. One preceptor, Levi Bennett, was a full-time musician before he started working at Vertus. His degree is in communications. The preceptors – and students’ relationships with them – change the dynamic in the school. Michael Mota, a senior who is Puerto Rican and Dominican, remembers only three teachers of color in his middle school, plus a cafeteria worker and a security guard. “Here it feels totally different,” he said. He described Vertus as a place where students respect each other and get respect from the adults, as well. Bennett said this dynamic stops a lot of disagreements. “Because the kids respect us, they listen,” he said. And, like Michael, he said much of the respect seems to be rooted in a sense of solidarity between the young black and brown men in the school and their mentors. Although they don’t teach classes, preceptors spend a lot of time with students, shepherding them through the school day and year. They are the ones texting and calling if the boys don’t show up to school. The preceptors monitor their group during lab time, guiding them through the online classes, as necessary. They are the main point of contact for parents and an anchor in the sometimes-chaotic lives of their students. Michael said Vertus does a good job of separating students from what they see every day in the streets, and preceptors are a critical part of that work. “Being here has really changed me,” he said. This story about personalized learning was produced by The Hechinger Report, a nonprofit, independent news organization focused on inequality and innovation in education. Sign up for our newsletter. *Clarification: this story was updated with Tanji Reed Marshall’s full title at The Education Trust.